Currently the 11th largest crypto in the world by market cap and pioneers of the first trustless Decentralized Governance on the blockchain, Dash is an organization on the rise with a mission of changing how people from all walks of life understand, interact with, and most importantly, use digital currency. 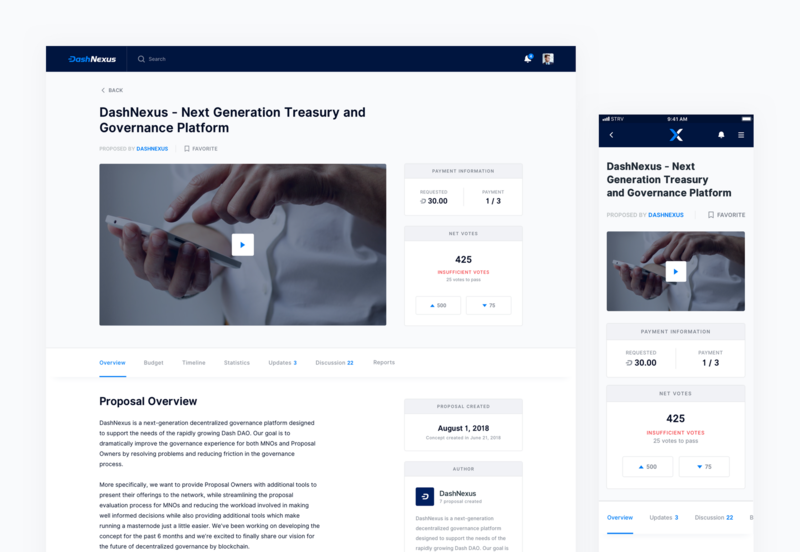 With the assistance of our in-house design team presently in development on Dash’s next-gen governance platform, Dash Nexus, STRV intends on helping them achieve exactly that. Whether you’re a long time crypto pro or the concept of blockchain is still relatively vague, there’s simply no arguing that digital currency has established itself as the future of money. When Bitcoin first appeared on the scene in 2009, the notion of an alternative form of currency completely revolutionized the concept of finance itself. This idea of a monetary system without borders or government restrictions which exists purely in the digital world signaled to many across the globe that the next gold rush had finally arrived. In the years that followed, cryptocurrencies quickly went from a radical concept within the tech community to a legitimate powerhouse in international fiscal markets, demanding attention from world governments themselves. In an attempt to capitalize, a wave of Bitcoin rivals emerged, flooding the market seemingly overnight — sending investors into frenzies which resulted in incredible fluctuations in cryptocurrency value. As a result, people and businesses across the globe amassed and lost great fortunes while the dust settled among the hundreds of cryptocurrencies vying to rise to the top — which brings us to Dash. What makes Dash special, aside from functionalities such as the ability to send instant or private transactions, or their upcoming Dash Evolution platform (think Paypal for crypto), is that unlike rivals such as Ripple, Ethereum, or Bitcoin, Dash is governed by an open source peer-to-peer Decentralized Governance system. Where a Centralized Governance system has a clear chain of command with the concentration of control of an activity (or of the organization itself) falling to a single authority, Decentralized Governance simply means the opposite; no central authority handing down decision from on high. In the case of Dash, decisions are made by the network’s stakeholders known as MNO’s (Masternode Owners) making it a self-governing as well as self-funding model. This system allows the Dash network to fund proposals, which add value to the ecosystem and fuel its further growth. The challenge with this type of self governing system is that there must be a platform by which the community members themselves can communicate and essentially decide on how funds are used. Until now, Dash has relied on a platform known as Dash Central for these purposes. 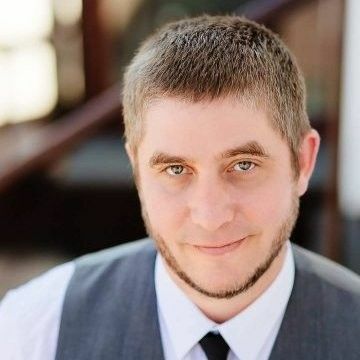 The problem; Dash Central was conceived quite a while ago when the needs of the network where much different and the monthly treasury department was just $17,000 per month (compared to that of $3 million today). The long and short of it; Dash needs a new, robust governance platform that can efficiently and effectively handle the needs of where community is at today — which brings us to the Dash Nexus project and STRV. Since winning the bid to develop the governance platform a few months back, STRV project manager, Fedor Filimonov, and his team have been diligently bringing Dash Nexus to life. We sat down with Fedor to hear his thoughts on the project as well as the challenges designing a governance platform have presented his team. At its core, Dash Nexus is a portal for members to make proposals and for MNO’s to assess them. Can you tell us a little about this process? 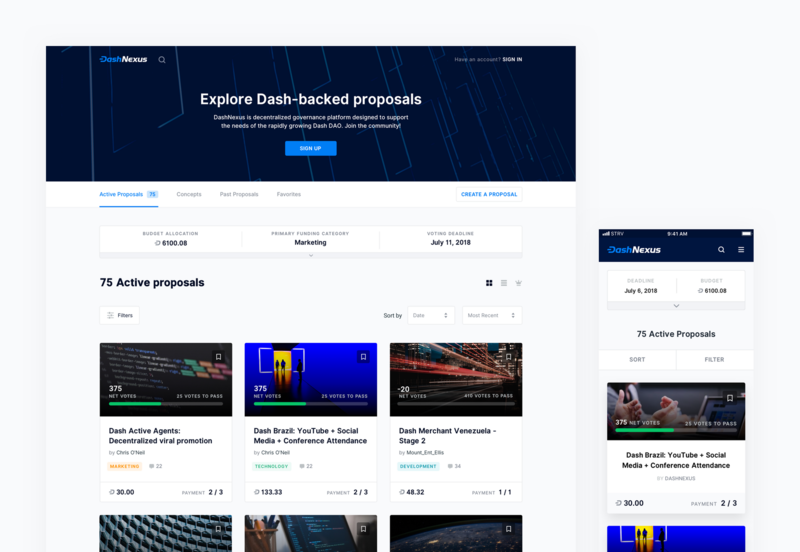 Proposals support the Dash ecosystem such as salaries of engineers, maintaining and improving the Dash network, legal fees, marketing initiatives, as well as promotional divisions such as podcasts, videos, and conferences. Anyone in the world can submit their proposal project and request funding from the community. MNO’s then vote on the best proposals and award funding from the treasury fund. So, essentially proposals are a means for those with collected interest in the success of Dash to invest in its growth and future? Where do the treasury funds come from? Investment from the MNO’s? No. On a monthly basis 45% of new Dash go to the miners, 45% go to MNO’s, and then 10% (roughly $1.5M at the current price) is secured into the treasury fund. Since funding for proposals comes from newly generated Dash it doesn’t cost MNO’s anything out of pocket. Tell us a little bit about STRV’s partnership with Dash on Dash Nexus. Nexus is the necessary evolution of Dash Central. STRV is not building Dash Nexus for any business entity but rather the community at large. Dash Central was developed when the amount of monthly proposals was relatively low, like 10 projects per month. Now it can get up to 90. Essentially, the old platform is inefficient at handling the volume of projects in a manner which is easily searchable and user friendly. 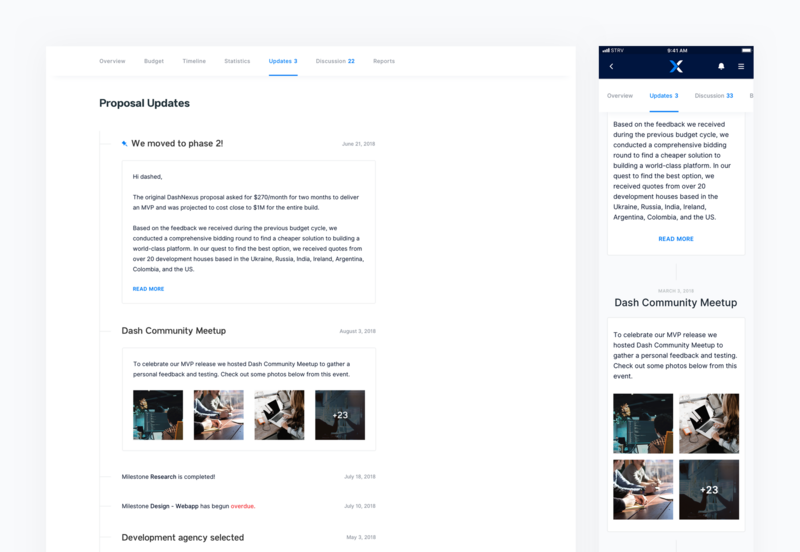 What are the goals for improving on Dash Central’s functionality, evolving the platform to Nexus? It’s been quite a complicated project on the design perspective straight away from the user experience and interface design. One of the challenges we have been successful in solving over the last couple months is how to present the huge volume of information in the most digestible way for the MNO’s and the members of the community (people who can leave comments and see the proposals but can’t vote on them). There’s also proposal authors and proposal owners who publish to the platform. How can we create a platform where proposal can get feedback from the entire Dash community so their chances of securing funding increases — which ultimately benefits everyone in the ecosystem? The Dash community is clearly driven to evolve digital currency in a way that is, in their own words, “so easy your grandma could use it.” How do you see STRV’s partnership with Dash bringing them a step closer to such an ambitious goal? 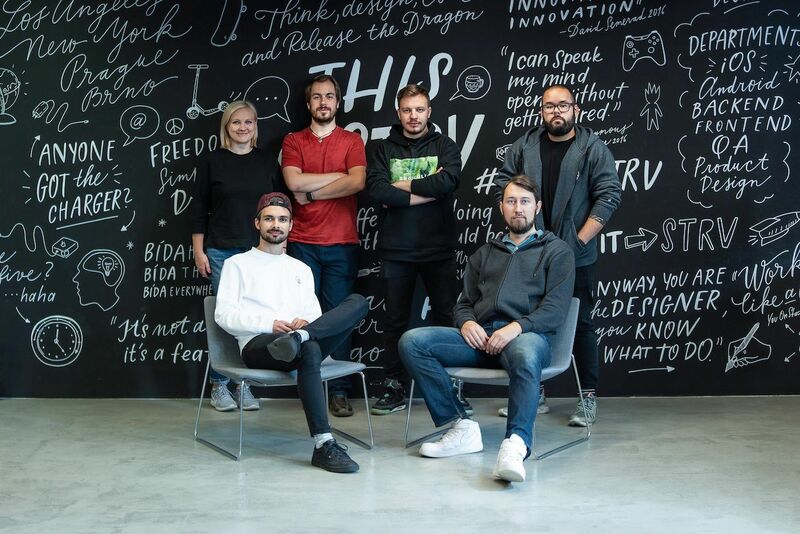 It’s been an absolutely fascinating project for STRV to work on with Dash and will most likely be a long term cooperation. From a technical and design perspective, Dash Nexus has been a complex but very fulfilling challenge. Dash is taking a concept like crypto and decentralized blockchain that’s not clear to most people and are working to package it in a way that makes it accessible to those who aren’t tech savy or crypto experts. Dash Nexus itself, as a project, demonstrates to the world that cryptocurrency ecosystems can be matured. This is a powerful revelation and Dash Nexus is a big step in that direction.